I've always had a slight obsession with neutrals so I thought I would share a few of my current favorites. These Tom Ford Sunglasses are definitely on my wish list, along with this gorge Tory Handbag. Can you tell I also have a slight obsession with accessories? J. Crew always has such amazing choices for creamy whites and blush pinks like these pants and this super chic swim suit. 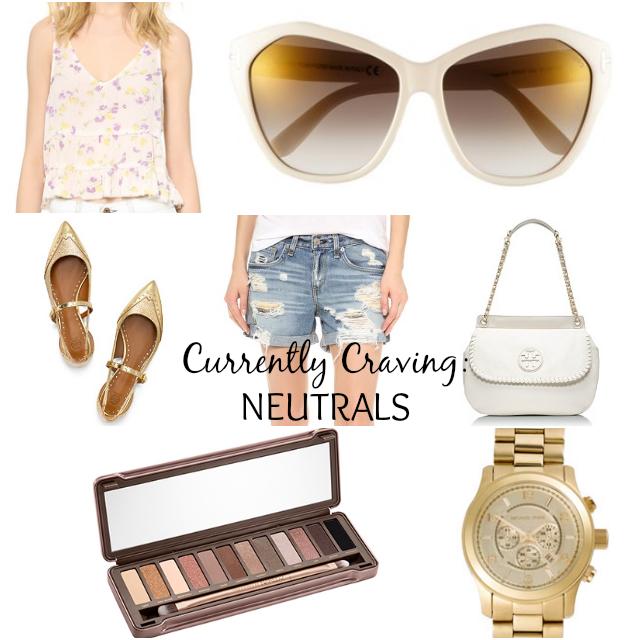 Check out the items below for other great Spring + Summer neutrals. Great picks! Love the distressed shorts, blush suit, and floral clutch! So pretty! I'm loving all the floral printed pieces! Definitely can't go wrong with neutrals! Also super obsessed with neutrals lately. I'm wanting a neutral bag most of all! I absolutely love those earrings - I included them in a recent collage - and I have that MK watch - love all of your picks!